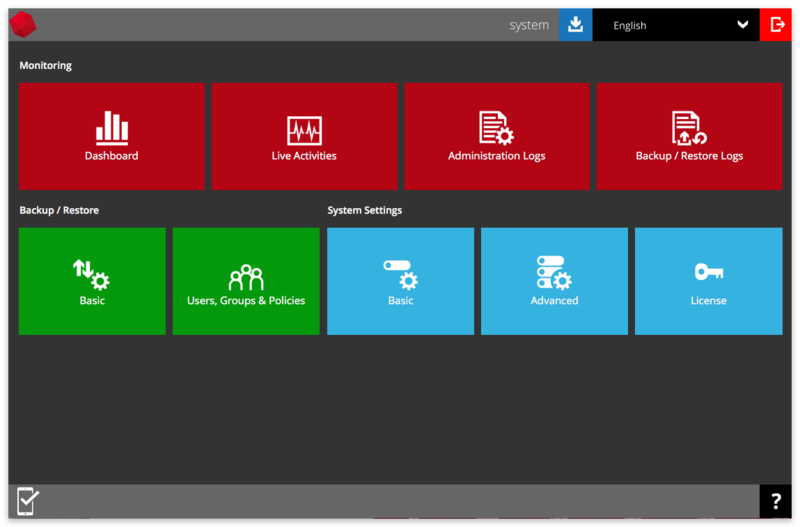 Retrospect Virtual Management Console is the backup server software: a web-based centralized management console for managing backup and monitoring restoration. Retrospect Virtual Host Server is the backup client software for installing on your VMware and Hyper-V virtual environment. With Retrospect Virtual Guest Add-on or Retrospect Virtual Socket Add-on, you can protect your virtual environment. Retrospect Virtual Host Server can also be installed within a guest to provide application-level protection for a virtualized application: Microsoft Exchange Database, Microsoft Exchange Mailbox, Microsoft SQL Server, Oracle Database, Lotus Domino/Notes, and MySQL. Refer to the following link for details of the operating systems, applications and databases supported by Retrospect Virtual Management Console. As a prerequisite, a fixed remote IP and internal IP are required for the Retrospect Virtual Management Console. Also, the firewall should support the TLSv1 cryptographic protocol. Download the Retrospect Virtual Management Console installation package. For the ports, enter the ports to be used by Retrospect Virtual Management Console. By default, the ports are 80 and 443 (HTTP and HTTPS respectively). If these ports have been used by other applications, e.g. Microsoft IIS, Apache or other applications, please use alternative ports such as 8080 and 8443. Click Next to continue when you are done setting. Run services.msc to open Services from Windows to confirm that the Retrospect Virtual Management Console service has started. In the following screen shot, the status of Retrospect Virtual Management Console is “Started” and the status of the NFS Service (Retrospect, Inc.) is “Started”. After successful installation, you can access the login page by opening localhost (https://127.0.0.1/) in a browser. Open Retrospect Virtual Management Console from your browser, e.g. https://<your-backup-server>;. Log in to the Retrospect Virtual Management Console with the following default credentials. To activate the license, click the License icon. If you are evaluating the Retrospect Virtual Management Console, you can use the evaluation license key provided on the page by default and click the Update button. If you have a purchased license, copy and paste the licensee name, license key into the relevant field, then click the Update button. Click the green Save icon at the bottom right corner of the page to save the settings. Note: If you are using the evaluation license key, you will be able to evaluate the Retrospect Virtual Management Console for 60 days. After which the Retrospect Virtual Management Console service will automatically stop working. Although the service is still active, the Retrospect Virtual Host Server clients will not be able to connect to perform any backups or restores. Set up a user home in your Retrospect Virtual Management Console to store the user’s information and back up files in your local location. Click the blue Basic icon on the Retrospect Virtual Management Console main page. In the User Home tab, click the + icon. Enter the directory path in the Home Directory field (e.g. D:\my_user_home) and click the + icon at the bottom right corner when done. Note: It is not suggested to store your user home in your system partition, e.g. C:\. Click the Save icon at the bottom right corner to save the new user home settings. Create a user account for the backup machine. Click the Users, Groups & Policies icon under the Backup / Restore section on the Retrospect Virtual Management Console main page. Click the + button to create a new user account. Enter the Login Name and Password in the relevant fields. The password should be at least 6 alphanumeric characters. Optional: Click the check box in front of the user group if you need to assign a user group for this user. The assignment can also be done later. Click the icon at the bottom right corner to continue. If you need to assign a dedicated storage location for the backup account, select Manually assigned and choose the storage location under the Home Directory section. If you select Auto assigned, you can skip this step. Optional: Host Name & Alias can be left empty if you do not know or do not want to enter the details at this stage. Set the desired Subscription Type. Select Paid User if you are creating an account for a user with no expiration period. If you select Trial User, service will be suspended for this user on the date you specified under the Suspend At drop-down menu. Select the status for this user account. Select time zone for this user and then click the → icon at the bottom right corner to continue. Select the backup user type the Backup Client section. You will need to select "Retrospect Virtual Host Server". Click the checkbox(es) to select the Add-on Modules for this backup user. Enter the backup quota value, and select the unit of this value from the drop-down box and then click the → icon at the bottom right corner to continue. Click the + icon to add user’s contact information. Fill in the contact details and then click the * icon at the bottom right corner to return to the previous *Add New User* page. Click the * icon at the bottom right corner again to continue. Click the Save icon at the bottom right corner to save the user information. 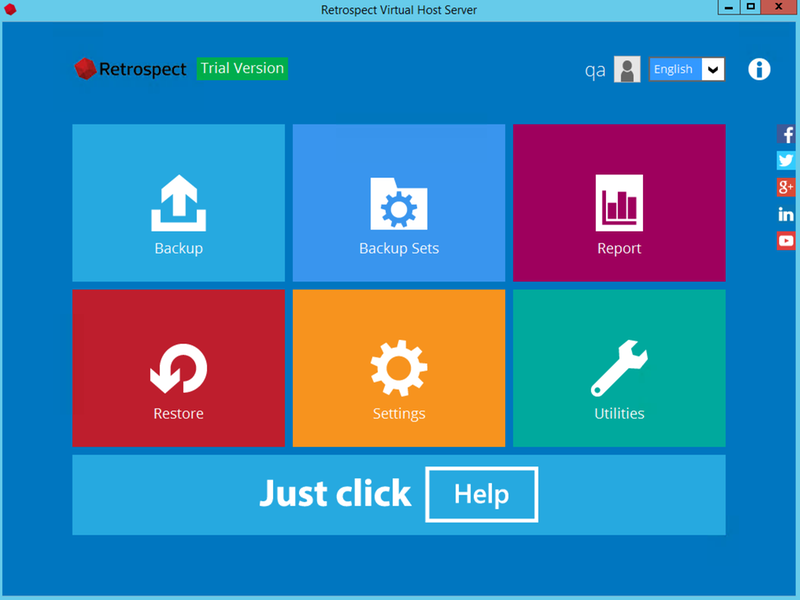 In a browser, download Retrospect Virtual Host Server by clicking the blue Download icon at the top right corner on the Retrospect Virtual Management Console main page. On the download page, select "Windows". Launch Retrospect Virtual Host Server. 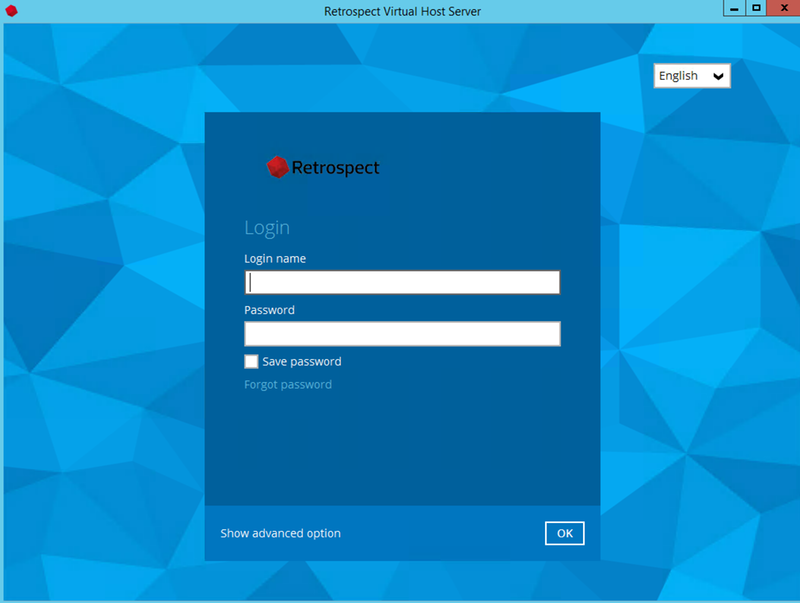 Login to the Retrospect Virtual Host Server application user interface. Enter the Login name and Password of your Retrospect Virtual Host Server account. Enter the host name or IP address of the Retrospect Virtual Management Console under "Show Advanced Options". Click OK afterward to login to Retrospect Virtual Host Server. The VM must be hardware version 7 or later. The VM must have zero (0) snapshots when CBT is enabled. The virtual disk must be located on a VMFS volume backed bySAN, iSCSI, local disk, or a NFS volume. The virtual disk must not be in Independent Mode (Persistent or Nonpersistent).